Fans often ask me about what I liked to read when I was young and which authors have influenced my writing over the years. When I was a kid, books were my world. My imagination was already in overdrive so reading about chasing bad guys and fighting off monsters just added fuel to the fire. While I was a thriller reader first and foremost, some of my other favorite books and writers might come as a surprise. Trevanian’s Shibumi will always hold one of my top spots for favorite spy books. At the time, I was reading a lot of serious characters but Nicholai Hel’s over-the-top personality and quirky humor in a genre that was largely devoid of laughs turned me into a fan from the outset. I think of Trevanian every time I add something funny to my books. In my mind, Tom Clancy was the man and The Cardinal of the Kremlin is a nearly perfect thriller. I was fascinated by the complexities of the Soviet era and voraciously read every book on that subject that I could find. Tom’s dedication to realism and exhaustive research set the benchmark that I, and my peers, still chase today. Clearly, I’m still influenced by Tom and that era because Red War, my upcoming Rapp thriller, revolves around Russia. I was a huge King fan and loved letting him scare me to half to death as I read under the covers when I was supposed to be asleep. I remember tearing through Salem’s Lot when it came out in hardback so I would have been around 8 or 9 years old. Oddly, my parents had no problem with me reading adult fiction at this age, but balked at me watching shows like Starsky & Hutch. I’ve always admired (and tried to emulate) how King can make a slice of everyday life go so wrong so fast. I couldn’t put down James Clavell’s epic story of Japanese samurai and ended up needing to get an extension from my 7th grade teacher because I couldn’t turn in my book report on time. Who knew there was a Book Two? What teenage boy wouldn’t want to immerse himself in a world of fearless swordsmen and beautiful women battling for power, honor, and love? Clavell taught me that classic story setups always appeal. In this case a fish-out-of-water scenario, which continues to be one of the best plot devices around. When I was just learning to read, this series really spoke to me. The independence. The courage. The resourcefulness and loyalty. Not only did it convince me that fearlessness was the only way to live, but what I learned from these kids flows into every hero I write. If you think about it, there’s a pretty straight line from the children living in that boxcar to Mitch, Irene, and Scott. Mary Shelley’s portrait of the complexity of human relationships still feels relevant today and did a lot to shape me as a novelist. No one is completely good and no one is completely evil. Every character is the hero of his or her own book. While I’ve moved away from this kind of moral ambiguity in the Rapp books, it was something I loved to play with in my own novels. The best antagonists are ones who we identify with on some level—even if it’s in the deepest recesses of our hearts. People know Jonathan Swift for Gulliver’s Travels, but it was his essay A Modest Proposal that got me going on Rising Phoenix, my first novel. Writing 300 years ago, he made the tongue-in-cheek proposal that the poor could improve their economic situation by selling their children for food to the rich. In a similar vein, my novel wondered if we could stop the use of narcotics by poisoning the supply. George Orwell’s work did a lot to shape my worldview, and I find myself quoting 1984 more often than I’d like. Orwell’s observations still feel almost clairvoyant more than half a century later. If you read Animal Farm today, you can put a current face to every inhabitant of that barnyard. If you’re not following Kyle, connect with him on Twitter, Facebook, or his website. Vince Flynn, the bestselling author of the Mitch Rapp thriller series died in 2013 after a long battle with prostate cancer. He was 47. 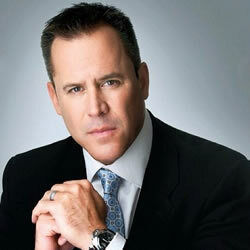 The fifth of seven children, Vince Flynn was born in St. Paul, Minnesota, on April 6, 1966.